It is a great tool for personal self-discovery as well and a great method for understanding how other people perceive the world and how they make decisions. While not overtly spiritual in nature, it does help oneself to understand the mechanisms at work behind the psyche. As well it is a good tool in that it helps you become more self-aware, and potentially improve your relationships with those around you. The test asks you a series of questions, and based on your answers categorizes you into 4 of 8 broad sub categories. Each category exists on a dichotomy continuum. The test gives you your result in a 4 letter acronym of 16 possible combinations, which represents the following categories. Extroversion (E) – Extroverts are outwardly oriented people. They tend to be quite talkative and are typically energized by being around other people and social situations. They tend to think out loud. Introversion (I) – Introverts are usually more quiet, private and contained. Large groups of people and social situations drain them, and they usually require quiet alone time to recharge their batteries. They generally prefer to work through ideas by thinking about them first, before expressing them out loud. Sensing (S) – Sensors are (micro) detail oriented people that prefer to focus on facts and concrete data. They are keen to observe and remember specifics quite well. They like to see hard numbers. They understand things piecemeal working through concepts from the bottom up. 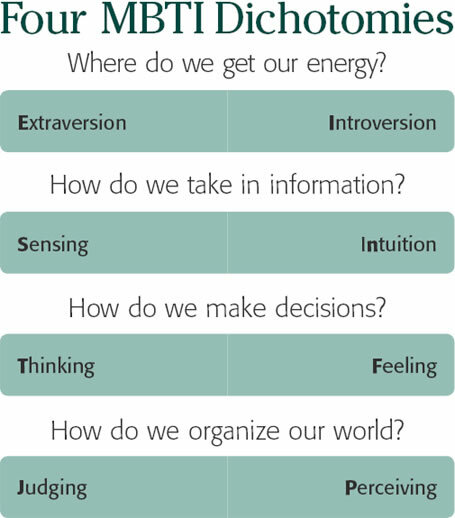 Intuition (N) – Intuitive’s (as per the MBTI definition) are big picture (macro) orientated people. These people are highly imaginative and focus on patterns and the meaning of data. They understand data better in how it relates to other data. They tend to understand concepts using a top-down approach. Thinking (T) – These are the analytical logic type people. They tend to use cause-an-effect reasoning when making decisions. Fair – to these people means everyone is treated equally. Feeling (F) – These people are more empathetic and base their decisions around feelings which are based on values rather than cold hard logic as the thinkers do. Fair – to these types of people means everyone is treated as an individual. Judging (J) – The judger’s (MBTI definition) are people who are methodical, scheduled and tend to be highly organized. They tend to make extensive use of lists and calenders. As well they prefer to get things done way ahead of time. Perceiving (P) – This type of person is more spontaneous and flexible. They have a more open-ended approach to plans and tend to be the ones that get things done at the last minute. Some people might be very near the ends, while others closer to the middle. Their is a high degree of variance. We all know people that are extremely extroverted that can yak your ear off and others who are extremely introverted that barely say a word. However most people are somewhere closer to the middle having a tendency to one end or the other. And this holds true for all the dichotomy’s in the MBTI system. This is why it is important to note the % score you receive for each letter. This will tell you how strong or balanced you are on each of the spectrum’s. If for example you score 100% on ‘E’ that means you are about as extroverted and outgoing as a person can get. If however you score a 15% on ‘E’ your general tendency will be towards extroversion but it may seem to a lot of people you are almost an introvert. From personal experience I have found that passion/curiosity is an attribute of generally either strong “iNtuition” or “Sensing”. 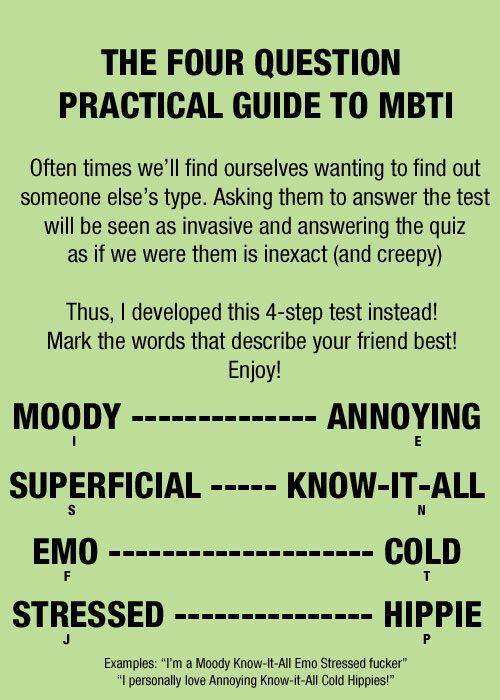 The Myers-Briggs personality descriptions match those people best who have on the whole a moderate to strong score on most of the letters (40-100%). If however a person scores less than 30% on all dimensions then that means their personality is quite balanced, and the 4-letter descriptions will only match their personality type in a vague manner. This is probably the greatest weakness in the Myers-Briggs system. It works very well for people who have strong personality dimensions, and not so well for those who are more even keeled. People with stronger personality dimensions also tend to be more passionate in certain areas of life, where as more balanced individuals may have a lot of interests, but more so at a surface level. There are obviously many other factors that contribute to the shaping of your personality. Environmental, genetic, astrological, experiential, modes of learning (auditory, visual, kinesthetic), cultural and many more. It is also possible your personality may change slightly as you age. The MBTI system does not address these, however it can still prove to be useful in explaining a general tendency. In terms of relationships it is often said “Opposites attract”. And this is true of personality types to some degree as well. Two individuals who have exactly the same personality type, while they may have fantastic mutual understanding may also quickly get bored of one another and would be somewhat out of balance. Extroverts balance out Introverts, and Thinkers balance out Feelers and so on. Where one person has their weakness’s another may have their strengths. Well balanced teams can utilize this to their advantage if used constructively. However differences can also be a source of tension and conflict if those differences are not properly understood. It is important to understand how people make their decisions and process information, as this can be vastly different from one person to the next. A thinker may become too rational, when making a decision, being accused of being cold, and a feeler may get too feely, being accused of being too emotional. It is easy to see how personality tendencies can quickly exacerbate conflict when disagreements across a dichotomy occur. However this knowledge can also be useful in that simply stating that you understand where a person is coming from even though you may not share their disposition, can help in preventing further alienation. Compassionate empathetic understanding is the goal here. It is important to embrace diversity for its creative constructive qualities. Environment, associations, parents can have a large impact on a person’s personality type. However I do believe people are born with their personality and it fundamentally does not change much throughout their lives. What does change is how people express themselves and how true they are to themselves which has monumental implications. For example in Japanese society extroversion is highly looked down upon, in Italian society is looked up upon. A person with strongly introverted parents that project those qualities on to the child, might think he is an introvert even though he is a strong extrovert. People’s projections can have a strong determining factor on how we choose to express ourselves behaviorally and what aspects of ourselves we choose to repress. Either consciously or often subconsciously. Most people that are ill, will be engaging in some form of active repression due to perceived idealized qualities. Some of this is cultural a lot is mal-adaptive. Over the long run this can cause serious problems for the personality and their health from an emotional point of view. An introvert trying very hard to be an extrovert is going to tax their adrenals. 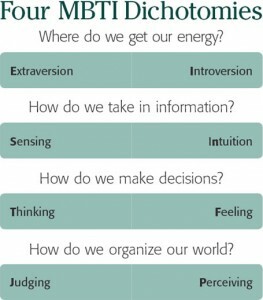 I find many people have fairly strong ideas of what it means to be an “extrovert” or an”introvert” and thus the Myers-Briggs system seems at times counter-intuitive. It is REALLY important to decouple the concept of “being social” or “social skill” from the extroversion/introversion metric. Extroversion is best defined by people who generally get energized by being around others and think out loud. Introversion is best defined by people who generally need more recharge time after having been around others and talk after thinking. Often many introverts can be better “socializers” especially if the are a “feeler” because they are more tuned into the emotions of others by being inwardly tuned into their own emotions. Introverts can also be better public speakers than extroverts more engaging and more confident seeming. Ability to socialize well is something that is entirely separate from a person’s personality disposition and is a learned skill rather than fundamental personality disposition. For example Perceiver types are more adaptable and more go with the flow, and thus in that sense are “more social/easy going” than a Judgmental type. A classic “Judgmental” is more uptight/wound up which may not be the most conducive to social harmony, yet that same person may be a strong extrovert in the sense they become highly energized by being around people. Another interesting link, that shows clothing style and some of the physical characteristic correlations. If people have strong personality’s this tends to more accurate. Note: Cultural and environmental factors can create artifacts skewing test results. The most difficult thing is being honest with yourself. Social conditioning is very powerful, and can cause people a lot of inner conflict if they are constantly trying to live by the standards of another person’s personality or cultural stereotype type that is different than their own.